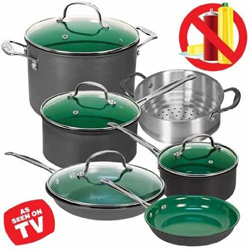 Orgreenic is a non-stick ceramic pan which claims it will not chip, flake or wearoff compare to other non-stick pans. It is called Orgreenic pan as it claims you can cook any food with little or no oil, grease or butter for healthier eating. The Orgreenic pan are similar to Green Earth Frying Pan by Ozeri. With your help we can reach more people and let them know about Orgreenic whether this product works or not. I bought the frying pan and it's not as advertised.. Everything I cook in it sticks, even if I use oil.. I have old Farberware that does a much better job of non stick..
uneven heat distribution. Pan gets dark in certain spots which is quite difficult to get rid off.